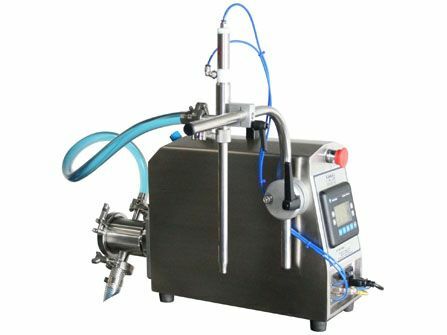 A pump filling machine offers flexibility for a wide range of product filling from liquids to shampoo consistencies with the ease of simply entering the amount you want in the container. Since liquid bottle filling machines are positive displacement pumps, they are self priming and can draw product directly from the bulk source whether that be a tank, drum or other container. 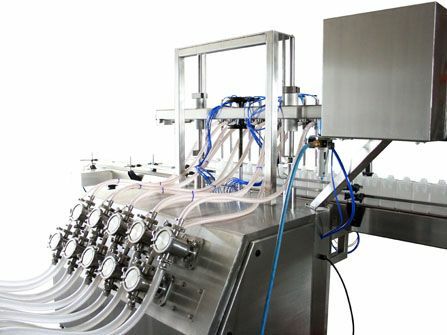 Pump liquid filling equipment is available from single head tabletop models, to 12 head inline automatic machines (see below). • 304 Stainless steel heavy duty stainless steel welded frame. • Allen Bradley PLC for all machine logic functions, special modifications on programs available for special adaptations. • Allen Bradley Frequency control drive for pump speed, acceleration and deceleration. • Front panel function controls through Allen Bradley panel. • Front panel Emergency STOP for easy access. 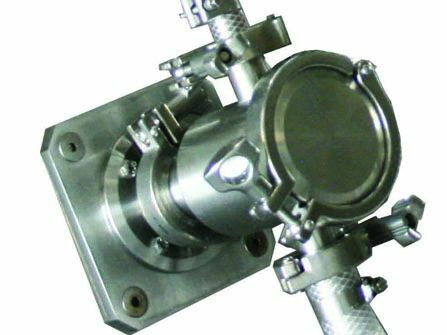 • Sanitary pump filler manufatured in 316L stainless steel, teflon or other sanitary materials. Toolless assembly. • Nozzle positioning by swivel arm. • Will work with plastic or glass containers. • No change parts needed for various types of containers. • 110 Volts, 60Hz, 5 Amps.• 2 CFM @ 80 p.s.i. • Allen Bradley 6inch touch screen for machines functions. 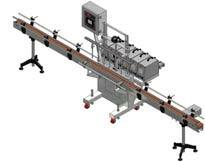 • Speed control of conveyor. • Front panel Start and Emergency STOP for easy access. • Fiber optic sensors by Omron standard for container gating. • No bottle no fill PLC controlled. • Job memory for recipe calling to minimize changeover times. • 8 inch stroke air cylinder with magnetic sensors for nozzle up and down movement. • Hand wheel counter mounted on volume control threaded rod. • Nozzle spacing fully adjustable through top or bottom screw. • Entry and exit bottle gating cylinders adjustable, sideways, up and down and inside and outside. • Color coded flow control valve for filling speed. • 220 Volts, 60Hz, 10 to 20 Amps (Depending on pump quantities). • 20 CFM @ 80 p.s.i.